Anti Apartheid Protest. 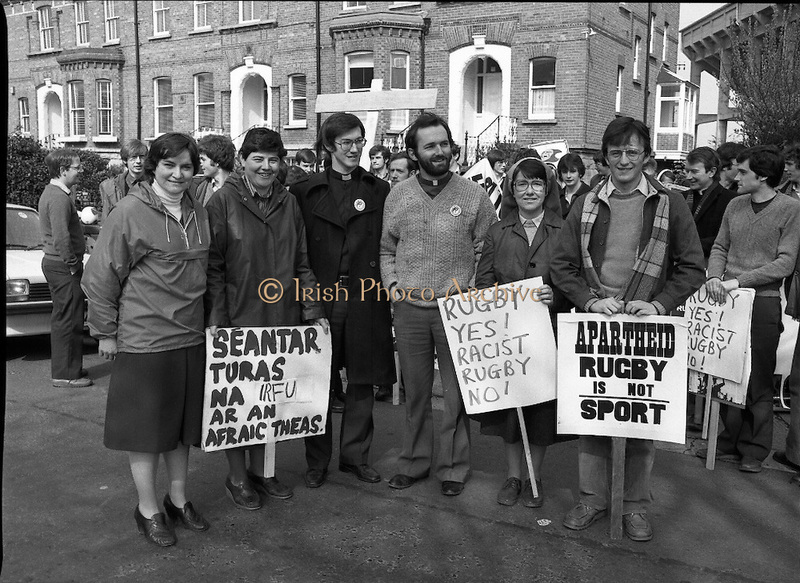 (N69)..1981..08.04.1981..04.08.1981..8th April 1981..In protest against a forthcoming Irish rugby tour to South Africa, members of the anti-apartheid movement held a protest at Irish Rugby headquarters. The group made up of both religious and laity were trying to encourage the rugby authorities to cancel the tour which they saw as giving credibility to a corrupt system of government...Picture shows ,Sr Marian Dooley FCJ ,Limerick, Maria Flynn,Little Sisters of Assumption,Tipperary, Fr Michael O'Sullivan SJ,Limerick, Fr Steve Cummins OSM,Cork,. Sr Bernie O'Donovan, Little Sisters of the Assumption, Kerry and Pat Donovan OMI from Tralee protesting at Irish Rugby headquarters.